This is a nice original 1861 dated 50 cent note from the states of North Carolina. This is the small version that measures 3-1/4th inches by 1-3/4ths inches in approximate size. 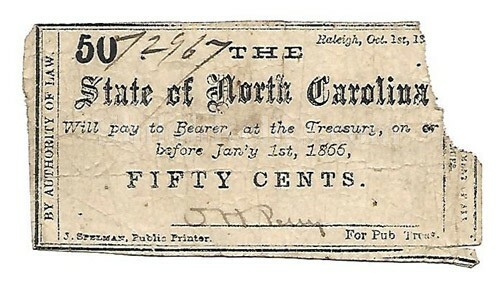 The upper right of the note it states that the note was issued from Raleigh on October 1st 1861. On the other side of the top it has the denomination of "5” printed. In the center of the note it proudly reads "STATE OF NORTH CAROLINA. Along the bottom edge of the note you can see the printed mark of the firm of "J. Spelman, Public Printer”. On the reverse of the note it is blank just as it should be. 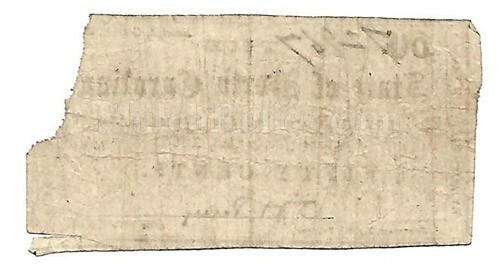 They refer to this one sided printing as the note being "uniface”. The note is hand signed and numbered and is in well circulated condition. There is a corner missing on the right hand side and it is priced accordingly. It comes in an acid free holder for display and preservation.